› Author Affiliations Funding This work was supported by the Association for the Promotion of Research in Atherosclerosis, Thrombosis and Vascular Biology (ATVB), and by the Ludwig Boltzmann Foundation for Cardiovascular Research, Vienna, Austria. Background Soluble P-selectin (sP-selectin), a biomarker of inflammatory pathologies including cardiovascular disease, is known to have pro-atherosclerotic effects such as the ability to increase leukocyte recruitment and modulate thrombotic response. We aimed to assess the impact of sP-selectin on long-term major adverse cardiovascular events (MACE) in patients after coronary stenting for coronary artery disease. Methods We analysed 733 patients of a single-centre registry undergoing percutaneous coronary intervention (PCI) between 2003 and 2006. Plasma samples were analysed for sP-selectin antigen concentration with an enzyme-linked immunoassay. The study population was categorized according to sP-selectin quartiles. Endpoint of the study was long-term MACE, a composite of all-cause death, myocardial infarction (MI) and stroke. 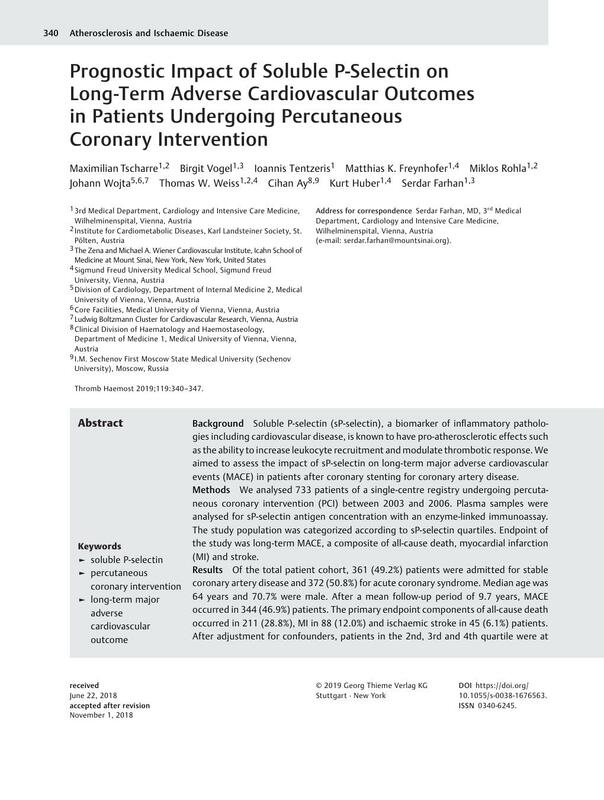 Results Of the total patient cohort, 361 (49.2%) patients were admitted for stable coronary artery disease and 372 (50.8%) for acute coronary syndrome. Median age was 64 years and 70.7% were male. After a mean follow-up period of 9.7 years, MACE occurred in 344 (46.9%) patients. The primary endpoint components of all-cause death occurred in 211 (28.8%), MI in 88 (12.0%) and ischaemic stroke in 45 (6.1%) patients. After adjustment for confounders, patients in the 2nd, 3rd and 4th quartile were at higher risk for MACE compared with the 1st quartile (hazard ration [HR], 1.234 [0.899–1.695], p = 0.193; HR, 1.480 [1.085–2.019], p = 0.013; and HR, 1.571 [1.115–2.152], p = 0.004). sP-selectin as continuous variable model was significantly associated with MACE after adjustment (HR per 1 ng/mL increase of 1.009 [95% confidence interval, 1.002–1.017]; p = 0.016). Conclusion Elevated levels of sP-selectin were associated with increased risk for long-term MACE in patients undergoing PCI.